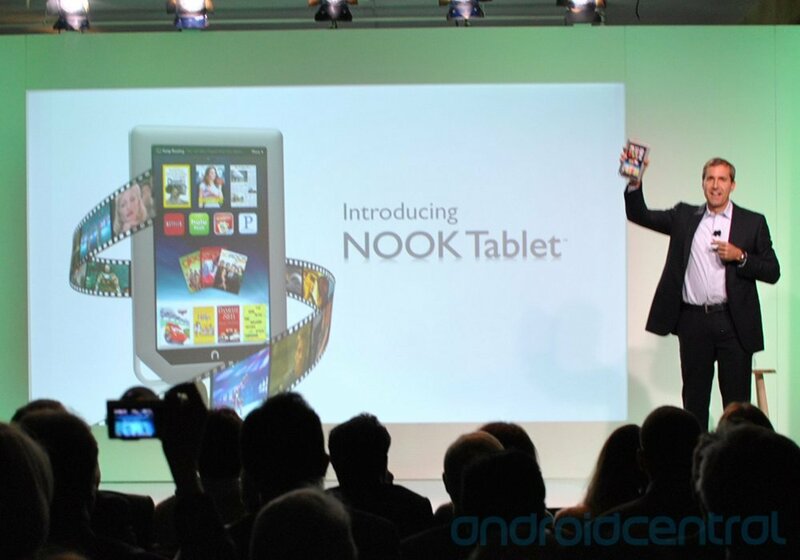 As expected, the Barnes & Noble Nook Tablet was just announced to the world. Following up on the Nook Color - the Barnes & Noble Nook Tablet gets some spec upgrades and this time around comes with a 1GHz dual-core processor and 1GB of RAM, weighs less then a pound plus, supports 1080p video for nine hours on a single charge. NetFlix and Hulu are on board for video content delivery and you get a plentiful 16GB of internal storage along with a up-to 32GB expansion slot. Pre- Order for the new Nook Tablet starts today for $249. Full press release is past the break for you all. bestselling NOOK® devices with the introduction of NOOK Tablet, the company’s fastest and lightest tablet with the best in HD entertainment. NOOK Tablet offers access to popular movies, TV shows, music and more through the top entertainment services, including Netflix, Hulu Plus, Pandora and others, plus a collection of high-quality apps, fast Web browsing and email. NOOK Tablet features Barnes & Noble’s award-winning color reading experience, with access to the world’s largest digital bookstore via Wi-Fi®. Now available for pre-order at www.nook.com and at Barnes & Noble stores for just $249, NOOK Tablet will be in stores and in homes on or about November 17. Find NOOK Tablet in the newly announced NOOK Digital Shops™, which feature the full portfolio of NOOK digital devices and FREE NOOK Reading Apps™ at neighborhood Barnes & Noble stores. Barnes & Noble also announced enhancements and incredibly new low prices for NOOK Color, the first-ever Reader’s Tablet™, and NOOK Simple Touch, the first breakthrough touch E Ink® device. The critically acclaimed NOOK Color will be even better next month, with more than 100 feature enhancements, access to top video and music services, popular apps, comics and more – and an even better value at today’s new incredibly low price of $199. The new and improved NOOK Simple Touch features the world’s fastest page turns and longest battery life, and an amazing new price of $99 – with no annoying ads. “In NOOK Tablet, we’ve created the best wireless media tablet in the portable 7-inch class. NOOK Tablet was designed for customers who want to read and be entertained with a variety of apps and media. Barnes & Noble designed the device for power, speed and responsiveness using the latest and most advanced technology. With a highly tuned 1GHz dual-core processor and 1GB of RAM, there’s plenty of memory to stream HD videos smoothly, browse the Web, and switch between books, magazines, videos and apps effortlessly. Barnes & Noble developed revolutionary battery life with NOOK Tablet, enabling 11.5 hours of reading time or nine hours of video viewing – the equivalent of five full-length movies. Everything looks stunning on NOOK Tablet, which features the world’s most advanced VividView™ display for viewing content, with 16 million colors and a resolution purity that’s simply gorgeous. Barnes & Noble invested in full IPS lamination to reduce reflection and glare and offer extra-wide viewing angles – perfect for sharing. movies and TV shows from Warner Bros. and other leading studios. NOOK Tablet owners can listen to millions of songs using the hottest music services, including Pandora, pre-loaded on NOOK Tablet, as well as Rhapsody®, Grooveshark and MOG, all available with a free 14-day trial. NOOK Tablet owners can also listen to their own songs wherever they go with the built-in music player. A powerful HD entertainment machine designed for maximum portability, NOOK Tablet is well under a pound (14.1 oz. ), making it one-third lighter than the leading tablet and 10 percent lighter than the award-winning NOOK Color. Sleek and thin with a soft touch back design, NOOK Tablet can be held comfortably for extended periods with just one hand and slips easily into a pocket or purse for reading and entertainment on-the-go. And with 16GB of storage – double the space of some other tablets – plus expandable memory, customers have ample space for their reading and entertainment content, regardless of Wi-Fi availability. between devices, as well as NOOK’s best-in-class shopping experience and social features. Barnes & Noble offers NOOK Tablet customers a wide array of top-rated NOOK Apps™ to play, learn, organize and explore with must-haves like Angry Birds Rio and Seasons, SCRABBLE, Epicurious, My Cast Weather, Taptu, Style.com, Spanish for Dummies, Bejeweled® 2, Ms. Pac Man and more. There are hundreds of popular apps for kids, including Dr. Seuss’ Cat in the Hat, Drawing Pad and Pop Up Peter Rabbit. All NOOK Apps are the best, highest-quality versions available, optimized for NOOK Tablet’s beautiful and ultra-responsive 7-inch color touchscreen. By the holidays, Barnes & Noble will offer thousands of high-quality NOOK Apps from leading third-party developers and content providers that can be enjoyed on NOOK Tablet, as well as NOOK Color. sites, from Facebook to YouTube, and stream brilliant HD videos. NOOK Tablet’s built-in email also makes it easy to stay connected with friends and family. NOOK Tablet customers can shop the world’s largest bookstore, featuring more than 2.5 million books, enhanced books, interactive magazines, newspapers, comic books and children’s books. Content downloads lightning-fast, usually in less than 10 seconds over Wi-Fi. NOOK Newsstand™: Choose from more than 250 newspapers and full-color, interactive magazines, delivered like magic to NOOK Tablet’s Active Shelf on the Home screen as soon as they become available. Barnes & Noble offers the largest digital collection of top 100 magazines, including PEOPLE, Food Network Magazine, Us Weekly, SPORTS ILLUSTRATED, TIME, National Geographic and many others. Colorful interactive magazines offer Barnes & Noble's ArticleView™, new animated page turns and smooth pinch, zoom and panning. Many special edition NOOK Magazines™ feature videos, quizzes, image galleries and more. New NOOK Comics: Barnes & Noble is offering a vast new collection of full-color comics, graphic novels and kids’ comics in high resolution that virtually make the action jump off the page. NOOK Comics will feature the world’s greatest superheroes with the largest digital collection of Marvel’s graphic novels available through a third party, as well as titles from other leading publishers, including Archie, IDW and Dynamite.
. NOOK Kids™: This holiday’s largest collection of more than 1,000 interactive children’s picture books and more than 12,000 chapter books just got even better. Bestselling books feature animation and engaging activities. With the new Read and Record™ feature, parents and grandparents can use NOOK Tablet’s built-in microphone to record and save their reading of any NOOK Kids picture books so children can listen to their favorite storytellers anytime. More to read: Barnes & Noble continues to expand its NOOK Bookstore™ with the vast majority of books available for $9.99 or less. New PagePerfect™ NOOK Books™ feature cookbooks, craft and art books rendered with rich precision to retain all the beauty of their stunning print versions. Enhanced reading: Reading is even more dynamic with PDF thumbnail page views, and image pinch, zoom and pan in books and PDFs. Unparalleled recommendations: Learn what to read next from Barnes & Noble’s knowledgeable booksellers, from must-read new releases to up-and-coming authors. Barnes & Noble’s personalized recommendations are based on what customers already love. In any book a customer is reading, a simple tap on the new NOOK Discover™ icon offers instant recommendations. Get more social: NOOK Tablet now makes it easier than ever for customers to share their reading experience with friends. They can connect with Facebook friends and others through NOOK Friends™, and find out what they have to say about their books, magazines and newspapers. Customers can also share their thoughts about the books they’re reading via email, Facebook and Twitter. Owners can share books, as well as browse and borrow books, from NOOK Friends using Barnes & Noble’s exclusive LendMe® technology. Continuous reading: Read what you love, anywhere you like™ on NOOK devices and with FREE NOOK Reading Apps. NOOK Cloud automatically syncs a customer’s library, last page read, bookmarks, notes, and highlights across all of their devices, so a customer can start a book on NOOK Tablet, and dive back in on their computer or smartphone. More entertainment and apps: NOOK Color customers will be able to download Netflix to watch movies and TV shows. Hulu Plus will also be available for NOOK Color in the coming months. Customers will enjoy top music services and thousands of apps including games, children’s apps and many others. Read your way: Customers requested the flexibility to read books in portrait or landscape and adjust the text with even more font sizes to choose from. The most user-friendly library: Customers will have faster, easier access to all of their content. NOOK Library is organized with tabs for books, magazines, newspapers and apps. The magazine display shows virtual stacks of covers with dates so customers can just tap on the issue they want and dive in. Enhanced shopping: NOOK’s amazing new Shop experience makes it easier than ever for customers to find their next great book, kid’s book, newsstand title or app. The NOOK Store™ is even easier to use, and more social and streamlined to show the breadth of content. also puts the focus on reading with no annoying ads, and instead lets customers personalize their screensaver with their own photos. Simple Touch customers can also enjoy these new benefits through a free v1.1 software update available today for immediate download at www.nook.com/update. Customers can also receive the free update over the air when connected to Wi-Fi in the coming weeks. This holiday, Barnes & Noble will make it easier for customers to give the gift of reading. Whether shopping in a Barnes & Noble bookstore, or beginning next month, online at BN.com, customers can give any NOOK Book or NOOK App as gifts. NOOK Tablet and NOOK Color customers will also be able to apply their Barnes & Noble gift cards – physical or digital – while shopping on their devices. late next week, in plenty of time for the holidays. Experience NOOK Tablet, NOOK Color and NOOK Simple Touch at www.nook.com or at the NOOK Digital Shops and displays in one of Barnes & Noble’s more than 700 bookstores and other leading retailers. Barnes & Noble offers Always Free NOOK Support in all of its neighborhood bookstores, with more than 40,000 NOOKsellers across the country ready to assist customers with setting up their NOOK devices or choosing their next great read. HD entertainment from top services and everything you want in a tablet at a great value ($249). Both NOOK Tablet and the award-winning NOOK Color™ ($199) feature a stunning 7-inch VividView™ Color Touchscreen to read all of the content you love, shop popular apps, connect via email, browse the Web and more. The NOOK Simple Touch™ ($99), is the fastest, easiest to use reader with the world’s best reading screen and the longest battery life. eReading products. Find NOOK devices in Barnes & Noble stores and online at www.BN.com, as well as at Best Buy, Walmart, Staples, Target, Radio Shack, Books A-Million, OfficeMax, Fred Meyer, P.C. Richard & Son stores, Fry’s Electronics and Systemax Inc. retailers. (www.nookkids.com), a collection of digital picture and chapter books for children, and NOOK Books en español™ (http://www.barnesandnoble.com/ebooksenespanol), the first-ever Spanish language digital bookstore in the United States. For more information on NOOK devices and eReading software, updates, new NOOK Book releases, Free Friday™ NOOK Books and more, follow us on www.twitter.com/nookBN and www.facebook.com/nookBN. one of the Web's largest e-commerce sites, which also features more than two million titles in its NOOK Bookstore™ (www.bn.com/ebooks). Through Barnes & Noble’s NOOK™ eReading product offering, customers can buy and read digital books and content on the widest range of platforms, including NOOK devices, partner company products, and the most popular mobile and computing devices using free NOOK software.